IN THIS PART OF COLLIN COUNTY. *Frances Cadenhead, known as Aunt Fanny, at 104 years, is the oldest person buried in Coffman Cemetery. As true of most historic rural cemeteries of this North Texas agricultural section of Collin County, the history of Coffman area is enriched by some firsthand observations of the descendants of early settlers, a few of these living whose recollections are very clear as are those of this writer Alma D. Littrell (November 26, 1903 a lifelong member of Coffman Community, now living on the family estate of one hundred plus years' ownership. My more than eighty years have been spent in touch with the area, wherein I retired in 1967 after forty-three years teaching in the schools of Texas of public and university rank. II. Coffman Cemetery Plot, Donated by John Coffman About 1840 as a Part of This Tri-Area Development. Among the earliest pioneer settlers of this area was donor of Coffman Cemetery John Coffman, introduced earlier, who in 1872 when Texas Central Railroad was built through this section and nearby town of Melissa was laid out, settled near this town at Old Highland Community as early as 1849.7 The Collin County 1950 Census and Mortality Schedule lists "Jno Coffman 043 46 M Farmer 1000 Tenn.",8 owner of 1000 acres, which could have prompted the Coffman Cemetery gift. The first burial at Coffman Cemetery as recorded on the markers is that of Dupuy (Dupry), Alfred H. May 22, 1852 - March 18, 1876,*. Coffman School, and Howell's store in accord with modern terminology could well be called a development extensive for its time. Of the three entities Coffman Cemetery is the only site remaining to interrelate its history through the three as each played its part. However, it was the store of the last quarter of the last century that afforded a community center for communication. Uncle Billy Howell's store - W. J. Howell (October 30, 1852 - January 15, 1921) was located at the crossroads, frequently traveled as the north-south road, and known to the locals as King's Trail. A portion of the so-called K. T. near Coffman Cemetery extending from McKinney to Sherman is still known as Telephone Road. This north-south stretch of rural arteries joined the east-west road at Howell's store, the community gathering place. *Refer to Appendix I- A, Pitts' survey, the source throughout this study for dates of births and deaths not repeated in the footnotes for this text. All other births and deaths listed in Appendix I,- B, C, D have been obtained by this writer on site observations of markers only, interviews with community (members), families and friends as given herein. III The Pitts' Sub-Title "Rollins Cemetery," Though Not Authentic Locally, Becoming by Family Choice a Priority. Of the 167 burials in Coffman Cemetery listed by Pitts, 18 are of the Rollins family.10 The Rollins not listed by Pitts in 1971, number 12 (one moved from Sherman) and those buried since 1971, number 6. With one Rollins "lost grave"l1he total of the Rollins name is 37(not including the Rollins women by their married titles). * 12 Thus by name Pitts rightfully subtitled the cemetery "Rollins." However, this name has never been used locally to designate the plot. Nor do the Rollins take precedence in time. Of the fourteen Rollins listed by Pitts born before 1900, only one Annie "d. - D. L. November 13, 1898 - November 13, 1898" was buried before this century. Dupuy or Dupry (May 22, 1852 - March 18, 1876) preceded the first Rollins buried in Coffman Cemetery by twenty-two years. 13 Thus the designation, of "Rollins" cemetery for "Coffman" cemetery, as a suggestion by Pitts, can be accepted by the number buried but not by history. The Rollins heritage as concerns Coffman Cemetery today could give credence to the name Rollins as a subtitle beginning with the family of R. L. Rollins (Bob, 1872 - 1939), and Alta (October 5, 1876 - December 26, 1958). 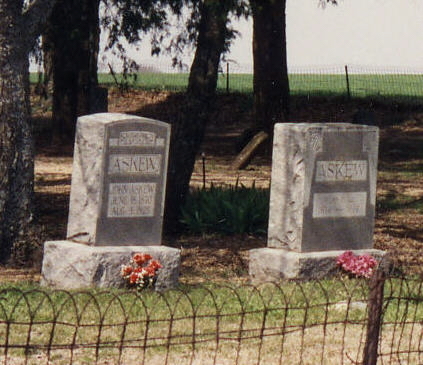 From this lineage two children of their six continued their father's firsthand concern - Mrs . T. J. Whitaker (July 25, 1897 - July 16, 1971), and Grady Rollins (November 1909- now living in Anna. It was Mrs. Whitaker's interest that made the community aware again that the cemetery was the only remaining site that could historically unify this farm area. She built on the earlier endeavor of Aunt Lizzie (Howell), spoken of earlier, who in her late fifties singularly took up a collection for cemetery needs. She drove her own Ford Coupe throughout the community requesting donations to build a cemetery fence - the historic steel that now stands. What money Aunt Lizzie lacked she acquired by gathering cotton bolls from the abandoned harvested fields and had these ginned. The ornamental fence and the front gate sign, bought by Mrs. Whitaker as a gift, are remembrances of Mrs. Howell's and Mrs. Whitaker's labors and their regards for Coffman Cemetery. Grady Rollins, the other one of the Bob Rollins family concern, and his wife Myrtle Lee (July 21, 1915 - ) of Anna, head the family of five sons - one deceased- who now carry on the Rollins tradition of Coffman Cemetery. Grady recalls that when he was about twelve, he followed in Mr. Bob's footsteps as this father helped the community men dig the holes to anchor in cement the posts of Aunt Lizzie's fence. 14 Grady's eldest son Grady Bob Rollins (June 27, 1933 - ) an independent business man of Anna, is now president of Coffman Cemetery Association organized in May, 19 81 .15 and Jerry Rollins (March 18, 1938 - ), vice-president of the First National Bank of Anna, is treasurer. * The other sons living a distance, frequently work with their parents and the two executive brothers of the Association in the interest of the whole Rollins family and of this community burial plot. *Except "Glasscock" listed by Pitts twice - under "Rollins" and under" Glasscock." Thus all along the cemetery with its steel fence - though it was not so well kept earlier - no longer has cows pasturing among the tombs. Busy community people throughout have in a way registered their concern for the cemetery by fences: a fence with poles, a dilapidated "no fence" and the latest, but old, steel fence of historic interest and safety. Comments of the people about a fence as a symbol of historic years, keep the Association listening. As one of the Blackburn kinsman of the four buried in Coffmanl6 on decoration day in 1968 remarked to this writer, "This fence won't burn." Interested persons from Dallas and farther have suggested modernization, but the fence as it now stands is considered a part of history. Gillard, Anice Irene, "Born and died, April 29, 1949"
Rollins,Maggie, 1874 - 1889 "Fourteen Years, nine months, 27 days"
D. Burials of No Markers, Termed "Lost Graves"
The three unmarked graves north of the rose bush - south center. There was once a community of Coffman here. It consisted of a store, a school, and the cemetery. 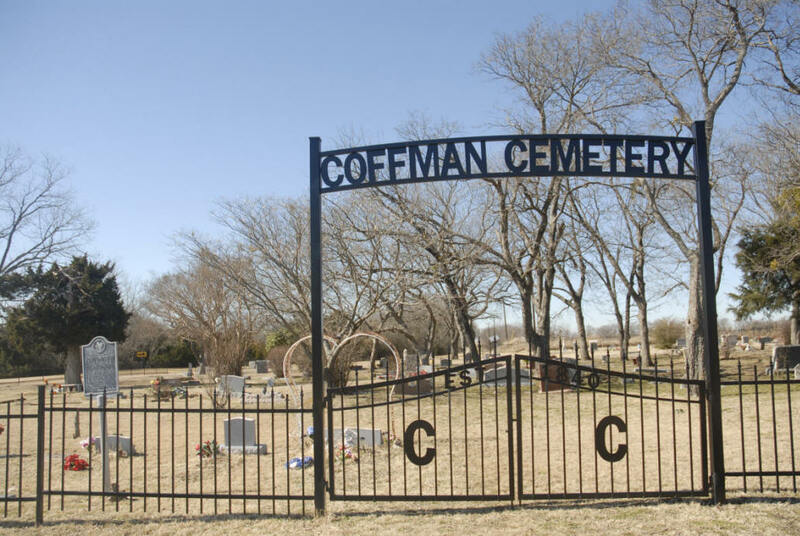 It is said that John Coffman donated the land for the cemetery around 1840. No deed has been found. If there is a deed and the date is correct, it would be in the Bonham Court House, since Collin County did not become established until 1846. The first burial in the cemetery was that of Alfred H. Dupuy, in 1876. This makes me doubt that the cemetery was established 36 years earlier with no burials. There are bois d’arc markers that could be from an earlier time, but there were stones being made in the area as early as the 1850s. This cemetery covers about 1 acre of land. It is fenced and has an arch over the gate. The cemetery is active and is well maintained.